The following is the second post of a Q&A I conducted with James Royston of Publish What You Pay. Adapted from the original PWYP blog post. A (James Royston): “The new normal” certainly doesn’t feel normal yet! We’ve been taking stock of where the PWYP movement now stands. We’re obviously pretty happy overall with the final U.S. rules, though they’re long and detailed so we – or at least I – still have to get our heads around them. And with the flurry of new company disclosures, we’ve been passing them around whenever they’ve been released, and have compared notes. We already have a few questions and have made quite a few discoveries — watch this space for more detail soon. Q: The Extractors have convened twice—first in Jakarta, Indonesia and more recently in Harare, Zimbabwe—so they’ve have had the opportunity to compare challenges and exchange skills. Has the chance for networking had benefits for the larger PWYP coalition? How do you hope it will over time? 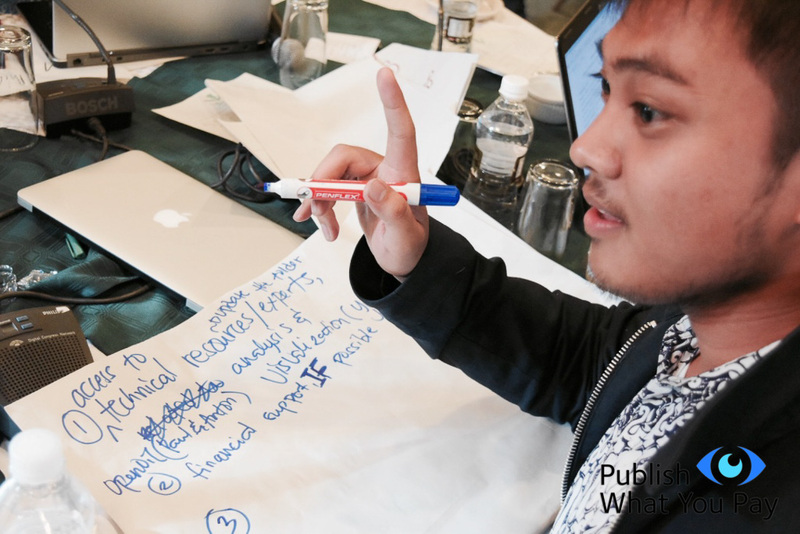 A: We’ve already seen a number of Data Extractors putting their new skills to work, so much so that three of them, Munkhjargal (from Mongolia), Marco (the Philippines) and Dewi (Indonesia) actually ran workshops together at our General Assembly and at the EITI’s International Conference, showing other PWYP members how data gathered by drones could win court cases (Indonesia), how a powerful mining transparency index, which makes companies assess their own transparency levels, was created (the Philippines), and how a complex concept such as beneficial ownership can be visualised (Mongolia). As well as something of a ‘Team Asia-Pacific’ emerging, where Marco is keen to share his infographic skills with colleagues from his region, there’s been a lot of expertise-sharing online. For example, through our online forum, Jana and Dewi have been comparing notes on how best to display charts in Waseem’s blog about the workshop PWYP-US ran recently. Q: The programme is now in its eighth month. What are some of the unexpected challenges or surprising benefits that participants have faced? What has gone differently than you anticipated? A: Some of our assumptions have certainly been borne out. We’ve seen some great infographics produced on the ‘irreconcilable differences’ between EITI data and mandatory disclosure data, for instance. Data Extractors, and even some organisers—including me—have a lot more knowledge about using tools to “scrape” data (to take data from PDFs etc) or to visualise it in a far more user-friendly way. I’m afraid technology has been a challenge in some cases – internet speeds in certain parts of the world make it really hard for some Data Extractors to join online discussions or download the programs and data they need. And finally, as some might have predicted and as we’ll be detailing soon, the new reports have thrown up a lot of questions. Miles’ Shell blog touches on some of these – is it OK to aggregate projects? How much money is paid by operators and not disclosed by companies? Q: As a practitioner and trainer in data driven advocacy for development, I’ve appreciated how the Extractors programme is designed to require a certain level of commitment both from the participants and from their organisations. Am I being too idealistic thinking of the programme as a dual commitment? A: No, I think that’s fair. As I mentioned earlier, we’ve found that the application process ensured a highly motivated team of Data Extractors. We wanted to make sure that the people who were signing up for this realised it wouldn’t be a cake-walk. It’s an intensive year, a lot of fun we hope, but also requiring a lot of work! But we were keen to increase the level of support from the Extractors’ own networks. So in the application process, we made sure that applicants had the backing of the coalitions of which they are members, as well as their employers. Dewi and Meliana’s boss Maryati Abdullah, for instance, was very supportive, as were all at ZELA, Mukasiri’s organisation. Q: I like the idea that as we create new data experts we must also spread data expertise—or at least familiarity—deeper into the Extractors’ organisations. Too often, there’s only one tech expert in an organisation and they have too many responsibilities or too little help to make the most of the data that’s become available. How has Extractors programme been supporting the participants to avoid that? A: We wanted to make sure this was open to anyone in our coalition who’s interested in working on data issues, and we knew that there would be more people working on data than would be immediately obvious. So we put a real emphasis on identifying ‘multipliers’ – people who can pass on their expertise to others in their organisation, in their coalition, and even in their local government. Some real stars have emerged. Q: For future phases of the program, what do you hope to expand? Or, what do you hope to revise or refine in the model? A: The year’s not over yet! So I’d hope there’s still more to learn as the year progresses, and as the Extractors get deeper into their projects. But, funding permitting, we’d like to see a second year of the programme. Overall the model we’ve followed has felt fairly successful, so I’d hope we’d do something similar again. But one big change I really want to see is to have ‘alumni’ from Year 1 leading sessions and passing on their knowledge to next year’s participants. We are currently looking ahead to the Open Data Con in Madrid, the OGP summit in Paris and the IACC in Panama later this year, and hoping some of our Data Extractors can present their work there.